Snoop Shopping My Inverted Pleat Skirt and Sewing Kits at Forever 21?? 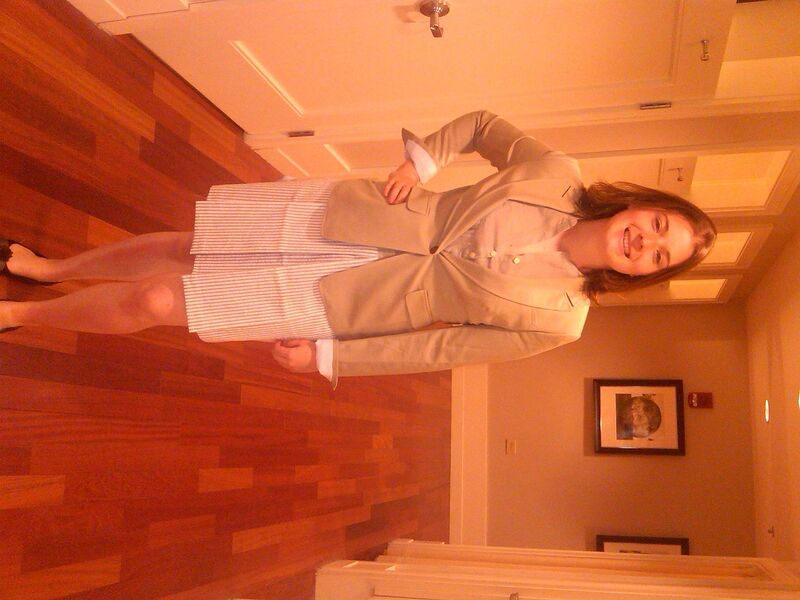 I went to Banana Republic yesterday at lunch with Liz to pick up a birthday gift card for my boss. 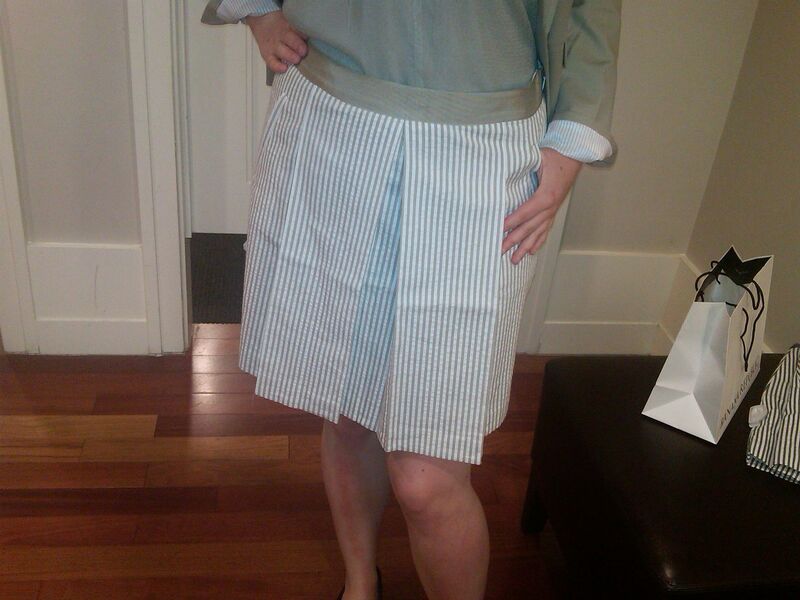 While there, I spotted an inverted pleat skirt in seersucker. It’s very similar to the denim one I recently completed. It’s not on the website and was on sale in the store for about $43. Poor Liz. She gets to be my default model these days. 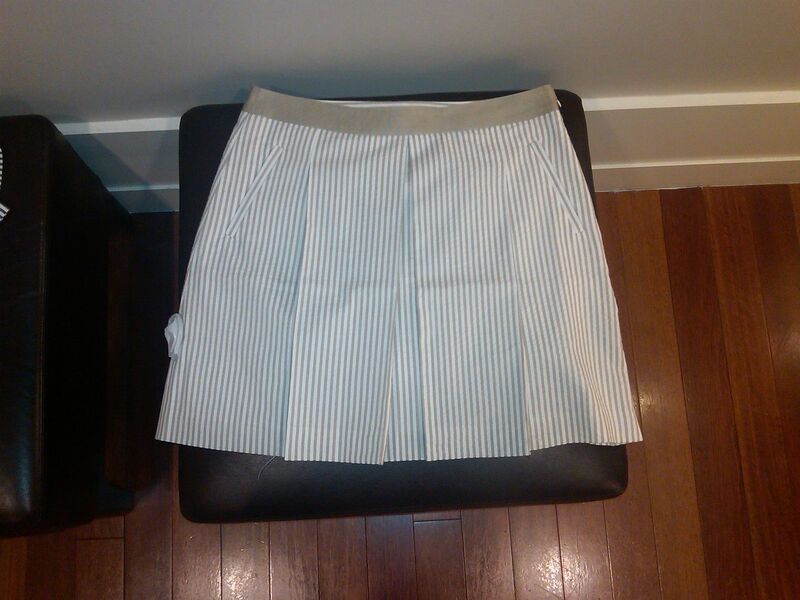 The skirt has the center inverted pleat, and them one pleat on each side of that (no front darts). They top stitched the waistline with a wide colored ribbon. Plus, the skirt is lined inside. I am still intrigued by this skirt! Thier’s is an A-line like mine. But, it does not have the same degree of flair out that I don’t like in mine. I think the trick is to make the skirt even longer to pull down the flair (last night Trena told me it’s still a little short for our mid 30s eyes) and in a lighter weight material. So, I’ll be taking another stab at this soon. 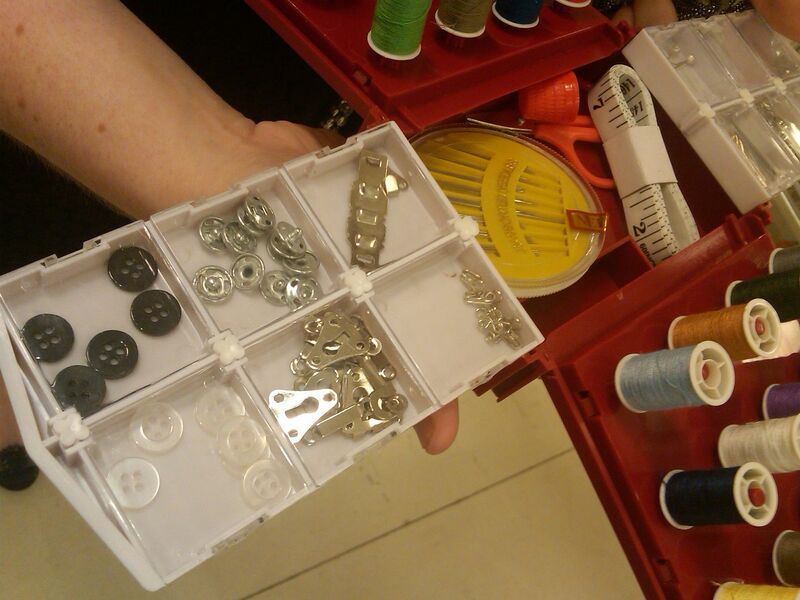 While out, I discovered a travel sewing kit at Forever 21. I usually pretend to be shopping for my niece when I go there. Anytime I send Trena a photo of something I’ve tried on, she tells me to take it off, put it down and leave the store. I guess they know you’ll need to repair your own clothes if you buy from them. I keep a very good repair kit in the office that gets more use from colleagues than I care to admit. But, I thought this was nice also. And, surprisingly sold there. It retails for $7.98 in the store and between $10 and $15 online. This one comes with buttons, snaps, safety pins. I think the box said it was meant for travel. I’m not sure. The store manager got pretty salty that I was taking photos of merchandise 🙂 That being said, Liz pointed out that I didn’t have a plastic factory to start making my own. Ha! True dat. I admit to buying a pair of tights at F21 over the winter. They opened one by Metro Center and I was walking by on my way to the orange line and I can’t resist tights. But the clothes, no. To me, that adorable skirt looks more like a pencil skirt with pleats added. I would SO have bought that sewing kit for my son for only $7.98, but since I’m >Forever21x2, I’m banned from that store so I would never have seen it. Darn, do I really brave a visit for a sewing kit?? OTOH, it will be *obvious* that I’m not shopping for myself. Hmm. It looks like as mini-version of some sewing boxes I picked up at the thrift store; I think they were given out in home ec classes in the seventies or so. 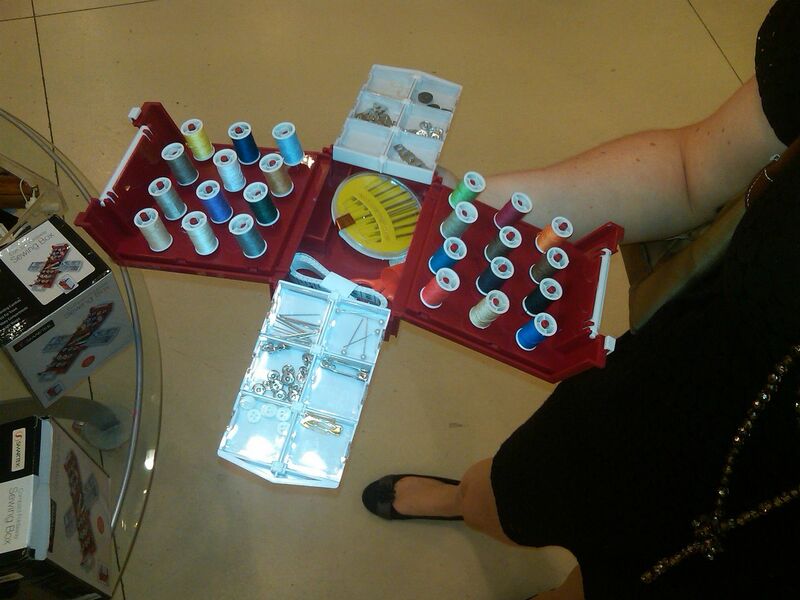 Very nice little boxes that hold amazing amounts of thread neatly and lots of pins etc. I liked the first one so much, that I bought another when I saw it again. I buy from Forever 21 for my daughters. That’s a nice mending kit; I might just look into it for the girls while they’re away at college. I would totally buy that kit, but for it’s engineering, size, and capacity! 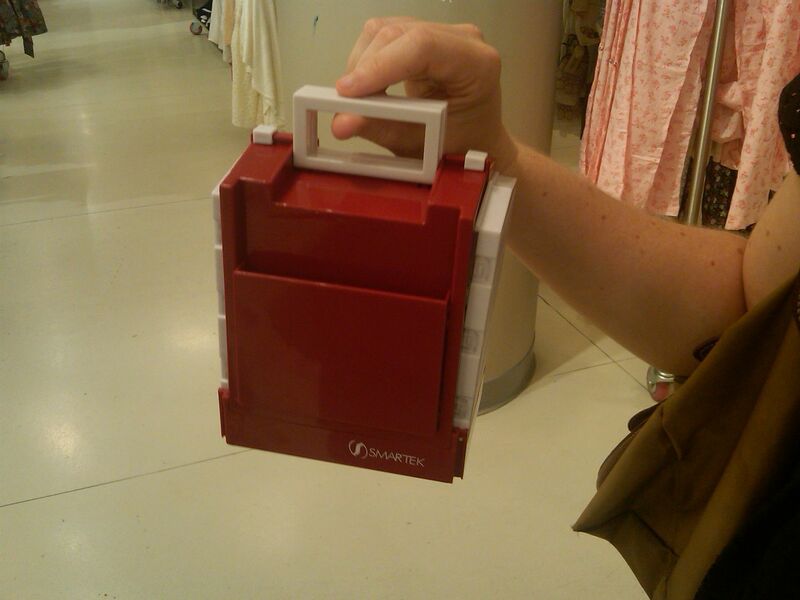 They can keep the contents, it’s the perfect size to fit in my wheeled, rollaway machine case! Wow! $7.95 what a bargain. That would be $30 here. I agree with that I think that skirt is a straight skirt not an A-line. I just want to say too that I love your bra so far. I really like your posts and get amazed at your production level! I guess they know you’ll need to repair your own clothes if you buy from them. If I’d’ve been drinking anything, I’d’ve spewed it right onto my monitor. Its been a while and I too lost your contact information (account got hacked! grrr!). I was poking around the internet and see you did a follow up to your first article about cutco scissors. I wanted to get in touch with you in regards to that, so please email me back. 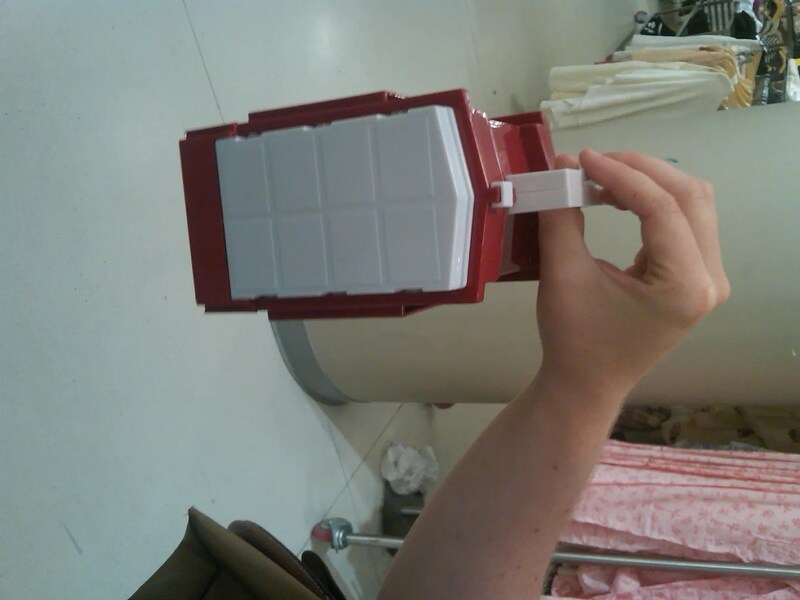 I ventured into Forever21 last weekend to look for nail polish. My 9 year old daughter begged to leave and asked that we never go in there again. I’m not sure, but I think the loud music and the general messiness of the store bothered her. That seersucker skirt is adorable. I’d love to get a closer look at the waistband. I’m Australian, so I didn’t know about the fatwa on Forever 21 when I was visiting NYC. I went in the shop, tried on a few things, and left with a ‘shrunken’ stretch denim jacket with funny little slogan patches and a tiny sequinned gold butterfly sewn on it here and there. I love it! Even though I’m 58. My sisters rolled their eyes when they saw it, though! Fatwa! That’s brilliant. I have gotten clothes there a few years ago. But, for me it’s the disposable mentality. But, they do have cute things! I am going to run to Forever 21 today, “pretend” I am shopping for my 14 year old, and try and find the sewing kit. You can make that seersucker skirt with your eyes closed. No kidding!!! Actually, I like your skirt much better than the F21 skirt. Those side pleats? Meh. I think yours is zippier and less dated. Love Trena’s comments to you, we all need friends that tell it like it is. I have many friends that I’d like to tell them to take something back to where they bought it from (or burn) but I’m just too timid….. I think that sewing kit will become my “go-to” gift for high school graduates that I don’t know very well.